The Beaver Brae Broncos visited DHS for the first time this year to take on the DHS Volleyball and Basketball teams. The Jr. Girls basketball came up with a 39-24 victory over the Broncos, while the Sr. team also came out on top with a 37-33 win. Jessica Skillen was the point leader for the sr. girls with 16 points. Tianna Markowski lead the juniors with 8 points, with Morgan Church and Hailey Yurkiw adding 6 each. 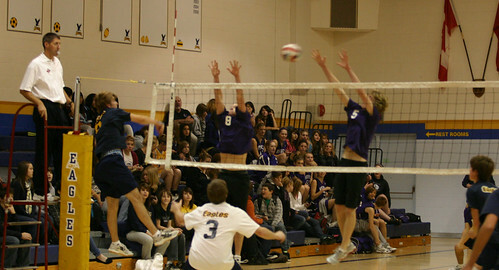 In volleyball, the junior boys won in straight sets, 25-7, 25-17 and 25-15. The senior boys were unable to match the Broncos, falling in three sets 25-22, 25-16 and 25-17. The Eagles court sport teams travel to Fort Frances Thursday the 15th to take on the Muskies. Eagles Football is in Winnipeg tonight to face Kildonan East. It is a busy weekend in tournament play, as the Senior and Junior Girls travel to Thunder Bay for a basketball tournament, the Senior Boys are in Winnipeg for volleyball and the Junior Boys host their annual home tournament here at DHS.